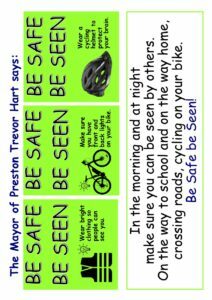 Be Safe Be Seen is a road safety project created by Mayor of Preston Trever Hart, Headway Preston and Glenn Slater Contractors, that provides school children and their families with important safety information to help them stay safe when outdoors. Be Safe Be Seen includes messages about wearing bright clothing, cycle lights and wearing a cycle helmet. Information for parents includes advice about crossing roads and using mobile phones when in charge of a child. The aim is to reduce and hopefully prevent the instances of serious injury (including acquired brain injury) through road traffic collisions involving children. Every week on average 12 children aged 0-15 are injured or killed on the roads in Lancashire, Blackburn and Blackpool. 68% of children aged 0-15, killed or seriously injured on the roads are pedestrians. A significant number of young child pedestrian casualties were accompanied by an adult at the time they were killed or injured. The most common cause of children being killed or seriously injured on the roads is a child stepping or running out into the road suddenly into the path of a vehicle. There are 100’s of other near misses that are not recorded. The project is kindly funded by Glenn Slater Contractors and through a Local Member Grant by Councillor Mark Perks LCC Young People Champion.